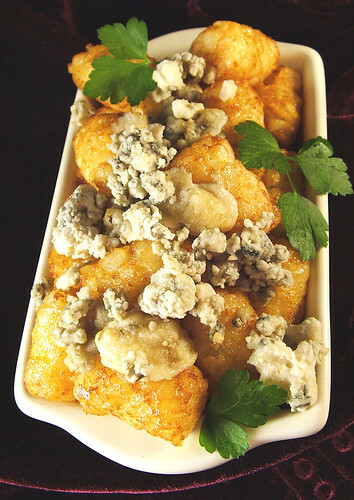 Baked tater tots with a gorgonzola crumble. Tater tots are not just for kids anymore. maybe tater tots are making a comback? the southern culture on the skids band include a whitetrash casserole on their website complete with lots of cheesy cheese and tater tots. LOL, perhaps! I didnt know they went out of style.. its junky food no matter what and that stuff is always around. No matter how much we Americans like to eat and talk about rarified vertical food (like Charlie Trotter or Tom Keller) we likely all still crave the crap comfort food we got slopped on our lunch trays at school.